Have you been touched—truly touched—by The People Brothers Band brand of love, peace, and harmony? It’s a feeling. It’s a sound. It’s an energy. And it’s something you can’t describe. It has to be experienced. I’ve been fortunate in more recent years, to really enjoy the band’s joy. Prior to one show, to also have the opportunity to spend time backstage with them before introducing the group to a big crowd—I was left beyond impressed. Teresa Marie is the only woman in The People Brothers Band, but don’t think she gets any special treatment. She sings, writes, and performs her heart out, just like everyone else in the “family.” Teresa knows she is part of something special, and took time to share her thoughts about it, just before the popular People Fest, August 10-12, 2017, at their own Driftless Gardens music venue. Maximum Ink: You spread happiness through your presence on stage. Have you always believed music could make a difference? Teresa Marie: I believe i was put on this earth to touch the world with music. I was humming notes before I ever said a word. I started writing little songs as soon as I could formulate thoughts. My little sister and I would put on shows for the neighborhood kids, but I was always in choir, show choir, musicals, etc., so I have always written, recorded, and performed. But, I feel music was never a decision; it’s been part of me all along, and all the way down to my soul. Honestly, the only way my desire has changed? I no longer desire the kind of fame I used to believe was needed to feel complete. MI: You are from Northeast Wisconsin, and not far from a small town outside of Green Bay where I grew up. We have both lived in many different places, but has the Madison area matched your musical expectations? TM: When I moved to Madison, everything kind of fell into place. It really felt like destiny! 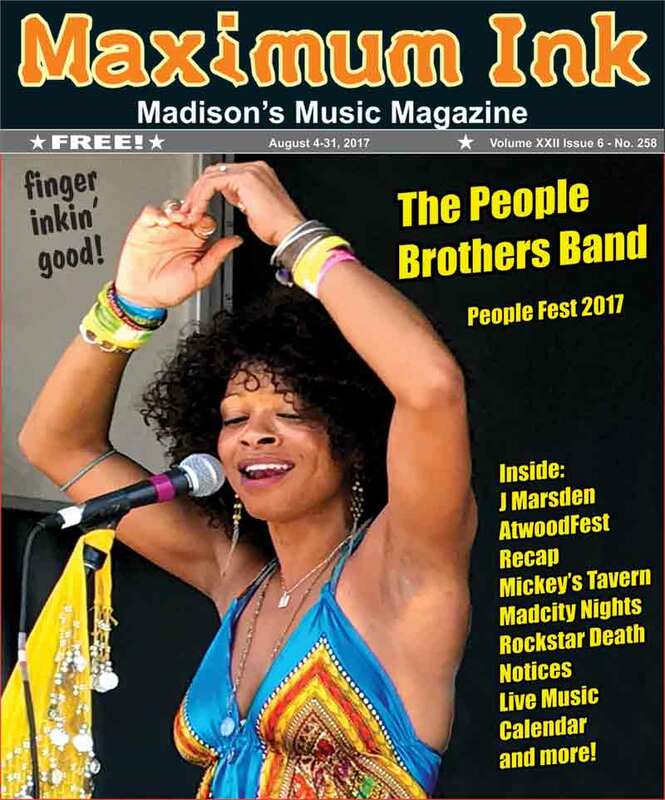 I met the love of my life, and I met my “Brothers.” The People Brothers Band started as a bunch of guys doing an open mic at the Come Back in Madison 9 years ago. We met when I walked over after my shift at the UpNorth Bar, just to check it out. After an acapella version of a Whitney Houston number, they asked me to join them for a show at Mr. Roberts, and the rest is history. I believe we found we have something very magical. We genuinely love each other, and what we create together. MI: The band is jam-packed with talent! TM: Tim Lochner is our rhythm guitarist and a vocalist, and really, he’s like the “Papa” of the band. He has worked hard to keep our momentum moving forward through the years. Greg Schmitt is our drummer and vocalist, and the eternal goofball. He always has something wonderfully silly up his sleeve. Scott Lochner is our bass guitarist. He is the reason you never see us do the same show. Robert (Bobby G) Gronna plays the keys, and is the other lead singer in the band. Bobby/s voice, and songwriting skills are amazing. Craig Baumann plays percussion, and shares in vocals. Paulie Matushek is our lead guitarist. I have never seen anyone play the way Paulie does…! Max (Maxophone) Felsheim is the sax player. He has a commanding and wonderful presence. Then there is me, Teresa Marie, the only lady and other lead singer and songwriter in the band. MI: Beyond all the talent, there is a special vibe you get from the band. How do you describe it? TM: We live our lives the way we play our music. It comes from inside of us and simply explodes when we get together. We are trying to touch the world with our music; and peace and love are the only ways we know how to do it. I believe love and music go hand in hand, and it is the only universal language. We want to keep this movement, this community, this family—spreading across the whole world. The future can be a beautiful one, because what happens through music is powerful and beautiful. All I want in life is to make the world a better place in anyway I can, and my brothers feel the very same way. MI: The band has been recognized for its great music with many awards. Are you most proud of one? TM: Though all the awards are special to us, what we are most proud of, is the way we have positively influenced other people. It’s also important to us to remember how we have grown with our fans and friends through the years, and we know without their love and support, we wouldn’t be where we are today. We really have sooo much love for our friends, and fans. It’s why we are like one big family!